We're your Greater Vancouver one stop scale model train shop! Central Hobbies will be open short hours on this coming Good Friday, April 19, 2019. We will be open from 11am to 4 pm. West Shore Curling Rink at Juan de Fuca Recreation Centre, 1767 Island Highway, Colwood. Central Hobbies will be there. If there is anything you want brought to the show please let us know in advance. 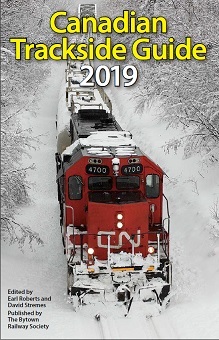 The Canadian Trackside Guide 2019 has arrived. The new Zephyr Express has arrived from Digitrax. It is a very good upgrade of the previous Zephyr Extra. The Kootenay Express 2019 is May 29 - June 2, 2019 in Cranbrook, BC. Train Sets are for all year long, not just Christmas. Central Hobbies stocks Train Sets all year round. Some of what we have is stock is on our Train Sets Web Page. The first release in Rapidos "Icons of Canadian Steam" release is the CPR Royal Hudson. We are taking reservations for these models now. Delivery for these models is delayed to 2019. Due to the large number of Rapido trains Announcements we now have a separate Rapido Trains Announcements Web Page. Parking is available at the West end of the building and behind the building. You may use spots 1 through 20. If you do not want to drive in Vancouver traffic don't forget you can get here easily by Skytrain. See Store News for local and store news. Quick Links: Z Scale, N Scale, Micro-Trains®, HO Scale, S Scale, O Scale, , and other scales, Brass models, DVDs on railroad subjects, Greater Vancouver's largest selection of Model Railroad Magazines and Books on Railroad Subjects. NMRA DCC (NMRA Digital Command Control) - We carry DCC products from Digitrax, SoundTraxx , NCE (North Coast Engineering), ESU , TCS , Lenz , and others. Please drop by the store for product information or a Demo. Products from other DCC manufacturers can be ordered. For The Beginning Model Railroader - - - - - - - - Mail Orders Welcome Services We handle Estates, Consignment sales, Custom painting and locomotive detailing, DCC installations and other services. We have several Max Jacquiard Prints in stock and can supply others. See Products and Announcements for information on new and announced products. The Events Schedule Page has information on coming Railroad and Model Railroading events. See our Special Links page for links to other Web Sites of Interest. Updated Aril 15, 2019 - Page and Contents Copyright Central Hobbies 2015 - 2019.